Suspended three metres up in the air above a crowd of expectant onlookers at the Deutsches Museum in Munich, a man sits quietly inside a metal mesh sphere. The operator at the control desk on the ground turns some dials to deliver a high-voltage charge of approximately 270 kV, which the visitors can see arcing across the spark gap. Unflinching, the man in the sphere sits tight and is eventually lowered back down to the ground completely unscathed. His current state of good health is all thanks to a discovery by the 19th century English physicist and chemist Michael Faraday, the inventor of a piece of apparatus that still bears his name today – the Faraday Cage. Faraday invented his cage back in 1836, although the American founding father and polymath Benjamin Franklin also made a great contribution to the development and application of the concept several decades earlier. Faraday observed that the excess charge on a charged conductor resided only on its exterior and had no influence on anything enclosed within it. To demonstrate this, he built a room coated with metal foil and allowed high-voltage discharges from an electrostatic generator to strike the outside of the room. He used an electroscope to show that there was no electric charge present on the inside of the room's walls. Earlier, in 1775, Franklin had conducted an analogous experiment in which he observed the effect of lowering an uncharged cork ball suspended on a silk thread through an opening in an electrically charged metal can. Here’s his description: “The cork was not attracted to the inside of the can as it would have been to the outside and, though it touched the bottom, yet when drawn out it was not found to be electrified (charged) by that touch, as it would have been by touching the outside. The fact is singular." So what exactly is a Faraday Cage? Essentially it is an enclosure – often in the form of a mesh – constructed out of a conductive material. The resulting structure blocks external static and non-static electric fields by channeling electricity through the mesh, providing constant voltage on all sides. Since the difference in voltage is the measure of electrical potential, no current flows through the space. Thus, a Faraday Cage operates because an external static electrical field causes the electric charges within the cage's conducting material to be distributed in such a way that they cancel the field's effect in the interior of the cage. 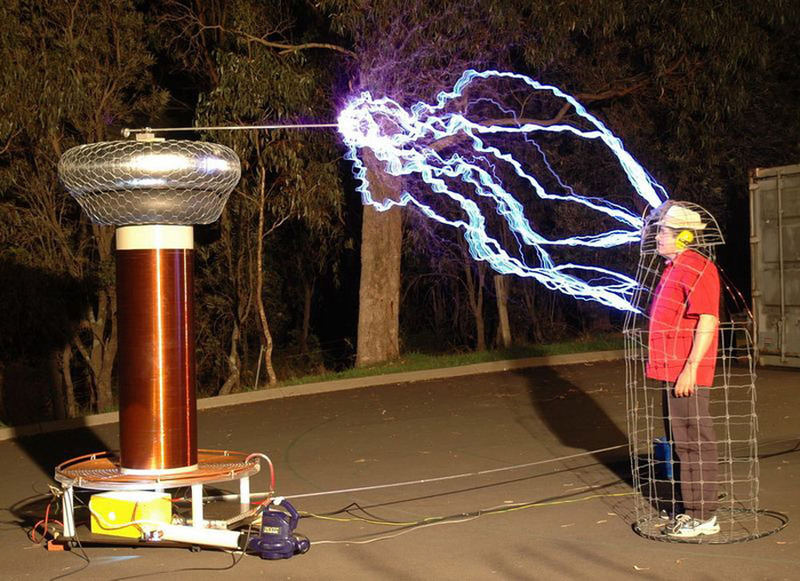 A Faraday Cage has some really useful practical applications, for instance to shield electronic equipment from electrostatic discharges or lightning strikes, or even the effects of solar flares, which are increasingly in the news for their potential to knock out electronics. For instance, the reception or transmission of radio waves, which are a form of electromagnetic radiation, to or from an antenna within a Faraday Cage is heavily attenuated or blocked by the cage. Interestingly, however, Faraday Cages cannot block static or slowly varying magnetic fields, such as the Earth's magnetic field, so a compass will still work inside one. In general, though, a Faraday Cage will shield the interior from external electromagnetic radiation if the conductor is thick enough and so long as any holes are significantly smaller than the wavelength of the radiation. For example, certain computer forensic test procedures of electronic systems that require an environment free of electromagnetic interference can be carried out within a screened room – a space that is completely surrounded by one or more layers of a fine metal mesh or perforated sheet metal. The metal layers are grounded to dissipate any electric currents generated from external or internal electromagnetic fields. Have you ever wondered why you don’t get fried when using a microwave oven? Such ovens incorporate a Faraday cage (which can be partly seen covering the window) to contain the electromagnetic energy within the oven and shield the exterior from radiation. Many electronic devices use a screened cable, such as a USB cable or the coaxial cable used for cable television, to protect the internal conductors from external electrical noise and prevent radio frequency (RF) signals from leaking out. Shoplifters have been known to use a so-called “booster bag” – a shopping bag lined with aluminium foil – to steal items tagged with RFID devices. The room containing a Magnetic Resonance Imaging (MRI) scanner is designed as a Faraday cage to prevent external RF signals from being added to data collected from the patient, which would affect the resulting image. Radiographers are trained to identify the characteristic artifacts created on images should the Faraday cage be damaged. As a passenger sitting in an automobile or plane you are essential safe from lightning strikes – as these vehicles also act as Faraday cages – unless the lightning ignites the fuel, that is! Even the Catholic Church has been known to make use of a Faraday cage, most recently in 2013 when one was used in the Vatican to shield the Sistine Chapel from electronic eavesdropping during the secret papal conclave to elect the new pope. There are numerous experiments you can explore around the subject of Faraday cages: National Geographic has a project aimed at survivalists who want to protect their electronic devices from EMPs or electromagnetic pulses, by modifying a simple trash can. Wrapping radios and other electronic devices in aluminum foil before putting them in the can provides even more protection.